Qi stagnation in the middle burner, liver qi stagnation invading the stomach, abdominal distention, abdominal fullness and pain, acid reflux, chest distention, epigastric fullness and pain, hypochondriac pain, gallstones, irritable bowel syndrome, increase appetite. 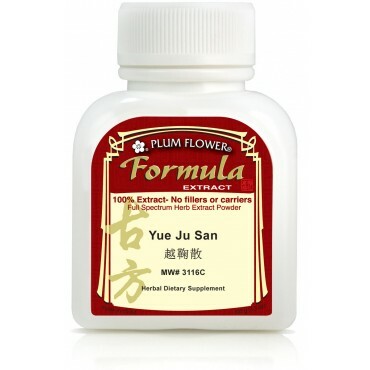 indigestion, nausea and vomiting are some of the imbalances satisfied clients have used this product for. Cyperus rotundus rhizome, Atractylodes lancea rhizome, Massa fermenta, Ligusticum chuanxiong rhizome, Gardenia jasminoides fruit. - Xiang fu, Cang zhu, Shen qu, Chuan xiong, Zhi zi. Contains tree nuts & wheat. The ingredient Shen Qu (Massa fermenta) is processed with wheat and may contain gluten proteins.